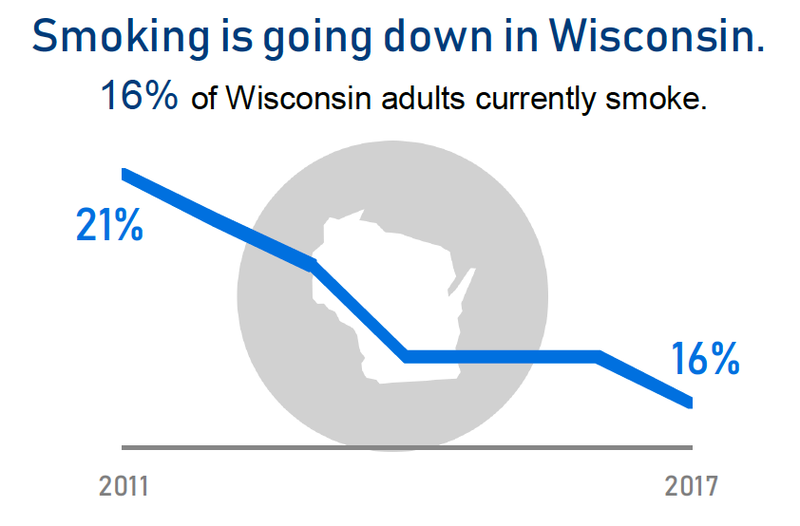 Fewer Wisconsin adults are smoking than ever before. The state's overall smoking rate has dropped to 16 percent, the Wisconsin Department of Health Services reports. That's higher than the national rate of 14 percent. It's a trend that — despite Wisconsin's smoking rates being higher than the national average — makes Dona Wininsky, of the American Lung Association in Wisconsin, hopeful. "While that isn’t necessarily great news for Wisconsinites, what is good news is that we're still on the downward trend. Our numbers here in Wisconsin are continuing to decline from over 30 percent, to 20 percent and lower," Wininsky said. "We were very excited when Wisconsin hit 18 percent a few years ago." "We see a very large uptick in e-cigarette use. While it isn't tobacco, it contains nicotine. It also contains flavors making it attractive to youth," Wininsky said. But Lorraine Lathen, director of the Wisconsin Tobacco Prevention and Poverty Network, said even a small decline adds up. "(The African-American smoking) rate had been nearly double the state average and it has actually declined a bit as well. (It) used to be at 31 percent, and it’s now at 28 percent," Lathen, who also directs the Wisconsin African American Tobacco Prevention Network, said. "These declines are small victories that add up to larger victories." "There are more tobacco retailers in low-income communities, two to three times more. And people are encountering tobacco advertising all the time," she said. "So, if you’re trying to quit and you walk into a gas station or convenience store and they’re promoting their products, those are triggers (to smoke)." "What are the products that young people are attracted to? What are the products that low-income and minorities are attracted to? How do we get the word out that there are health risks associated with these products?" said Lathen.